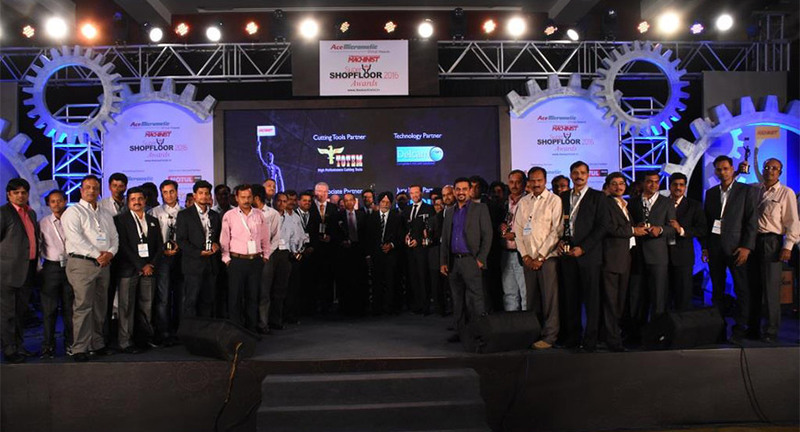 The third edition of The Machinist Super Shopfloor Awards 2017 organised at Feathers – A Radha Hotel on May 18 in Chennai, celebrated excellence in Indian manufacturing. The ‘Machie’ trophy was conferred upon the winners in various categories such as Safety, Productivity, Machining Excellence, Digital Manufacturing, Innovation and Green Manufacturing. The event was managed by Seventy Seven Entertainment. Apart from rewarding best practices adopted by the shopfloors and plants, The Machinist also recognised individual contributions towards the Indian manufacturing sector. In this effort, Anshul Goel, MD, Duroshox Pvt Ltd was announced as ‘The Machinist Super Next Generation Leader 2017’ and Ayush Lohia, CEO, Lohia Auto Industries Ltd was declared as ‘The Machinist Super Entrepreneur 2017.’ The most prestigious ‘The Machinist Lifetime Achievement Award 2017’ was bestowed upon Mr. Sandeep Singh, MD, Tata Hitachi Construction Machinery Company Pvt Ltd.
On the occasion, an engaging ‘CEO Panel Discussion’ was held on the topic of ‘Can India become a Manufacturing Super Power?’ The eminent speakers in the industry threw light on the challenges and possibilities of the theory. The Machinist Super Shopfloor Awards 2017 was presented by Ace Micromatic Group and was powered by MotulTech. The other partners for the ceremony were Cutting Tool Partner — Forbes & Company Ltd (TOTEM), Talent Management Partner — DDI, Associate Partners— igus India and Tyrolit Group, Trophy Partner—EOS, and Hospitality Partner—Feathers - A Radha Hotel. The Machinist, part of the Worldwide Media (WWM), takes forward the legacy of some of the most successful awards in the country in varied fields such as Filmfare, Top Gear Awards and Lonely Planet Awards amongst others.